From Catalog #76, though no longer available, this 1920s Montblanc Model 0 Baby Safety eyedropper-filled vintage pen must be shared! It was available in the extremely rare red mottled hard rubber, with the correct and crisp imprint of Montblanc 0 14ct nib in fine, flexible. This model was new-old-stock, mint in original box. 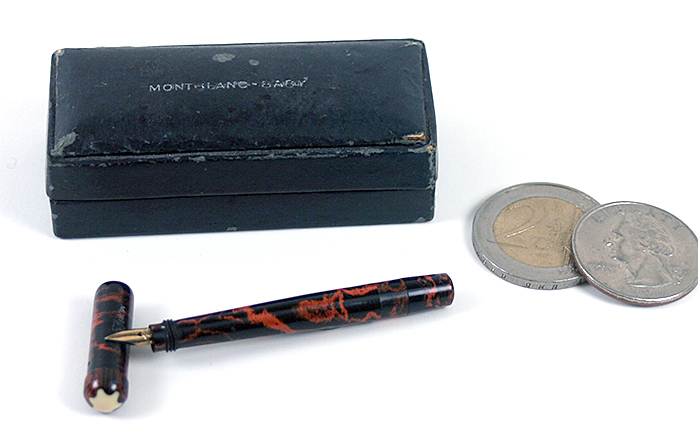 The box was signed on top with ”Montblanc baby”, and although the box has seen many years, it was only a little threadbare. What a small, adorable pen, with great value. This entry was posted in Vintage Pens and tagged Catalog, Montblanc. Bookmark the permalink. Follow any comments here with the RSS feed for this post. Post a comment or leave a trackback: Trackback URL.